My first reaction on reading this was, “What a brilliant concept!”. For a corporate organization to be innovative, it needs to be allowed to think. It’s employees need to be provided with the opportunity to have random, creative thoughts that are not inhibited in any way, but are allowed to run free. It’s gratifying to hear that many corporate organizations are now using my blog posts as “thought starters” for their employees, but companies need to do more and strategically embed creativity into their cultural DNA. Unfortunately, for some CEOs, innovation is merely just lip service. The concept of “Codex Seraphinianus” is a fantastic example in “thinking that little bit differently” and inspires those reading it to open and expand their imagination. It breaks all the traditional rules, which I can only applaud. Yes, this is my first book review and I give it 4.5 out of 5. Why not 5? 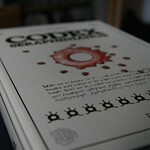 Well, the score of 5 has been reserved for your own version of “Codex Seraphinianus” of which you will be the author. This version will I’m sure be a creative masterpiece!